← Why should you get up early? When a novel becomes an international bestseller 62 years after its original publication, there has to be something to it. Jeder stirbt für sich allein by Hans Fallada was published in Germany in 1947 and finally got translated into English as Alone in Berlin in the UK and as Every Man Dies Alone in the US in 2009. It is the story, closely based on real events, of an ordinary German couple and their acts of resistance against the Nazis. I could keep this review very brief: The book has 600 pages and I finished it within less than a week, reading every night until long after midnight. This alone demonstrates that it is a riveting thriller which you won’t be able to put down easily. But there is more to it: “Alone in Berlin” is a story about life under the Nazis, about political resistance, it is a thrilling detective story, and it is about a husband and wife who find together again through a common endeavour. Yet the book is not overloaded and all these different strings are woven together perfectly. Anna and Otto Quangel live in war-time Berlin and are neither members of the Nazi party or their sub-organisations, nor are they overtly critical of the system. That is, until their only child dies as a soldier at the front. Out of this feeling of personal loss, Otto Quangel decides he has to “do something” and starts to handwrite postcards with slogans against the Nazi regime and drop them in stairwells of buildings around the city. Upon hearing of this idea, his wife Anna asks “Isn’t that a bit small?” But they both agree that any act of resistance is better than none, and are aware that they are risking their lives. Much of the action takes place in the apartment house where the Quangels live, which is like a microcosm of Germany in 1940 or 1941: There is a bestial Nazi family who support the regime not least because it has given them personal power, there is an old and frightened Jewish lady whose husband has been “taken away”, there is a retired judge who is still respected although he is obviously not a follower of National-Socialism, and in the back part of the house there are the gamblers and the whores who don’t have any political affiliation but look out for their personal gains wherever possible. The disastrous economic effects of Nazi rule and World War II and the economic incentives that this puts up for Germans play an important role throughout the book: Both the Nazi family and the thugs in the apartment block see the Jewish lady as potential prey to enrich themselves. Once this has been accomplished, they are stealing from and cheating each other. Information is given to the police to receive monetary rewards, or suspects are blackmailed for the same purpose. In Hans Fallada’s war-time Germany, most Germans are not too worried about the war itself (this was before the turning points of Stalingrad, El-Alamein and Normandy), civil liberties, one-party rule or the Holocaust, although he is clear about Germans’ knowledge of concentration camps, the murders taking place there and even of the atrocities committed in Eastern Europe by the Wehrmacht, the SS and other military and para-military forces. If Germans bear a grudge against the Nazis in the book, it is because they have to live on ration cards. Another striking point about German society at that time is the dominance of fear. Not only the obvious fear from the Gestapo and the SS, but also fear of being reported to the authorities by neighbours, co-workers and even members of the own family. The whole country is under a cloud of fear and mistrust. It might be that Hans Fallada is apt at recreating this mood, because he was one of the few German writers to remain in Germany throughout the whole 12 years of Nazi rule (which also lead to him becoming a somewhat contested writer after 1945) and to observe country and society. The Quangels’ distribution of postcards goes on slowly, with a maximum of 2 or 3 cards dropped per week, but soon the Gestapo learns of the cards and starts to investigate. Inspector Escherich, an intelligent detective, becomes more and more obsessed with his hunt, but it will be a long time – and some innocent victims – later that he will learn of the Quangels. 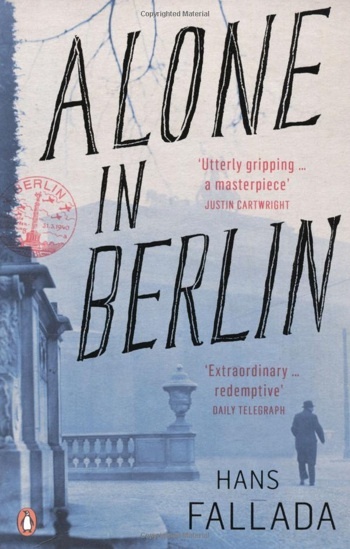 This detective story part of the book is so extremely thrilling, with twists and turns, near-misses between predator and prey, that “Alone in Berlin” can be recommended as a thriller alone, even if you are not interested in German history. Reading this book leaves you in an even more dramatic state if you know that it is very closely based on the true story of Elise and Otto Hampel, a couple in Berlin who start to write anti-regime postcards after Mrs Hampel’s brother dies in the German attack on France. Some editions of “Alone in Berlin” and “Every Man Dies Alone” contain excerpts from the original Gestapo file, including samples of the postcards and interrogation transcripts, at the end. Reading these, the similarity between the true and fictional storylines is striking. Elise and Otto Hampel were sentenced to death and executed, a fate that Anna and Otto Quangel are threatened with as well. I want you to read the book, so I won’t reveal the ending here. The story of the Hampels (or Quangels) and of other German attempts at resistance – of which there were embarrassingly few – leads to the question if the lesson shall be that resistance was ultimately futile and thus not worth the risk and sacrifice, or if there was not enough resistance? Fully aware that any ideas about how I myself would have acted in a dictatorship are mere speculation and wishful thinking, I strongly tend towards the second view. For the Quangels at least, their resistance had become something the futility of which they blinded out but which gave them the rewarding feeling of personal courage and moral superiority. And it revitalised their marriage in a way which nothing else could have done. Primo Levi called Alone in Berlin “the best book ever written about German resistance”. This entry was posted in Books, Germany, History, Holocaust, Politics, World War II and tagged Gestapo, Hans Fallada, Nazis, Third Reich, thriller. Bookmark the permalink. Good review, Andreas – I think we got similar things out of the book!